Anterior Ischemic Optic Neuropathy (AION) is a serious disease that can happen in people that are middle aged through the golden years. This disease is also known as a stroke of the optic nerve (eye stroke). It can occur with little warning signs, and often spreads to both eyes. AION can be devastating diseases because it can leave the person with severe visual impairments. One of the forms of AION is known as Non Arteritic Anterior Ischemic Optic Neuropathy (NAAION). This is the most common form of AION. People of all ages can get NAAION, with about 10% being under the age of 45. Male and females are equally at risk. NAAION occurs when there is an acute problem with circulation in which the arteries supply the optic nerve. 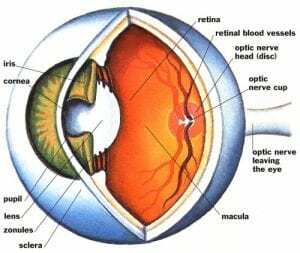 This occurs when there is a dip in blood pressure, which results in there not being enough blood pressure to go through the vessels that supply the optic nerve. This can happen by a number of reasons. Certain illnesses can make the risk of NAAION occurring greater. Diabetes Mellitus and Sleep Apnea are often seen in individuals who have had NAAION occur. It has been proved that when someone’s blood pressure drops while they sleep at night, they gain a greater risk of getting NAAION. More than seventy five percent of people who have NAAION had vision loss when they would wake up. This alone will not cause the disease, but when added with other risk factors it can attribute to the problem and be the cause of it progressing. AION will vary by individuals. Someone could still have 20/20 vision, while others will suffer profound visual loss. This loss depends on the location and the amount of optic nerve that was affected by the eye stroke. After someone has AION, their contrast sensitivity is changed. They may not be able to see the changes when reading or judging depth. At this time there are not many options when it comes to directly treating the optic nerve. It is common for Doctors to put the person on drugs that will lessen the intravacular pressure which can help protect the nerve. Baby aspirin may also help prevent AION from happening in the other eye. If the person smokes, that should be eliminated. Being diagnosed and treated will help lesson the vision problems associated with AION. Usually people with AION will see improvement after a few weeks or months after the vision loss. Sometimes it will not get better, though. People learn to adapt to the change and it will eventually become less noticeable. There is a possibility after a few years of having AION occur in the other eye which was not affected at first. It is important to routinely have your vision checked, especially if you are at risk by having Sleep Apnea and Diabetes Mellitus. Having early detection can prevent you from getting serious vision impairments. Your Doctor can help inform you on what you need to know about the disease and what steps to take in preventing it. Doing so will insure your eyes stay healthy and reliable for many years to come.